PLANET KINDERGARTEN is a brilliant idea for a picture book - the kind that makes you wonder why no one thought of it sooner! 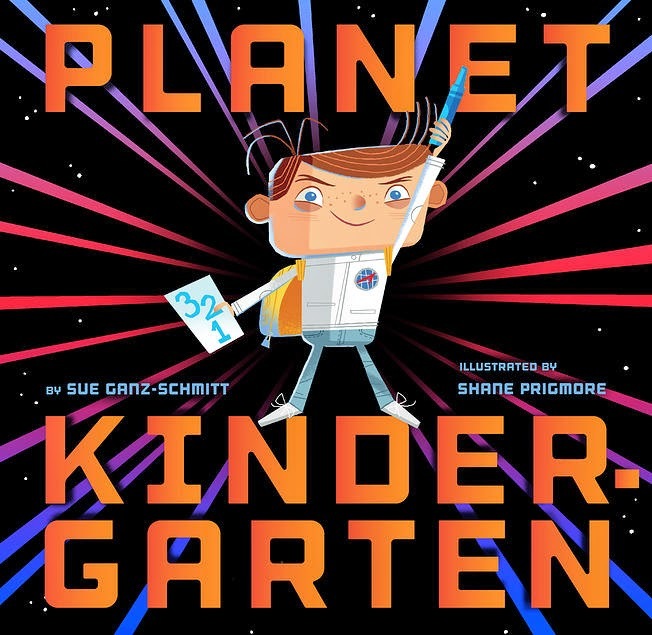 PLANET KINDERGARTEN is written by Sue Ganz-Schmitt with a great attention to detail when is comes to comparing the first day of kindergarten with a NASA mission. But what really puts PLANET KINDERGARTEN over the top and into orbit are the brilliant illustrations by Shane Prigmore, an accomplished professional animator (Shane is the award winning character designer for Coraline, and contributor to projects like The Croods, Foster's Home for Imaginary Friends, Rise of the Guardians and How to Train Your Dragon) who brings his ample skills to the page. The countdown starts before the first page we learn that our little astronaut/kindergartner has been given two thumbs-up by his doctor. The minivan blasts off, arriving at base camp only to orbit while looking for a place to dock. 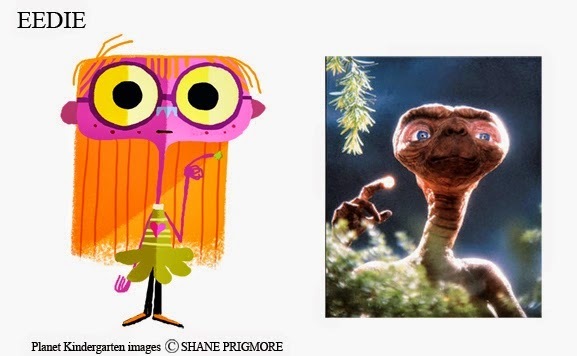 Prigmore shares his inspiration for the illustrations on his fantastic blog (which also includes character designs for his work on the LEGO movie!) and you can see in the images below. 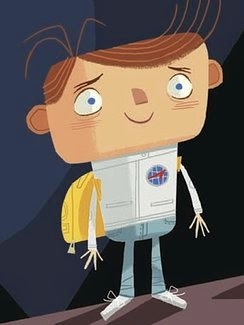 While working the astronaut-kindergartner theme expertly, the text does allow for the moments of anxiety, sadness and difficulty that make up any first day at a new school/space station. 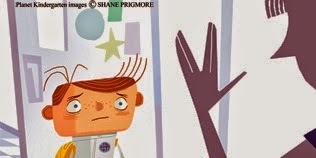 Mom slips a photograph of herself into the narrator's pocket as she and dad wave goodbye - mom's Vulcan salute is a superb addition. 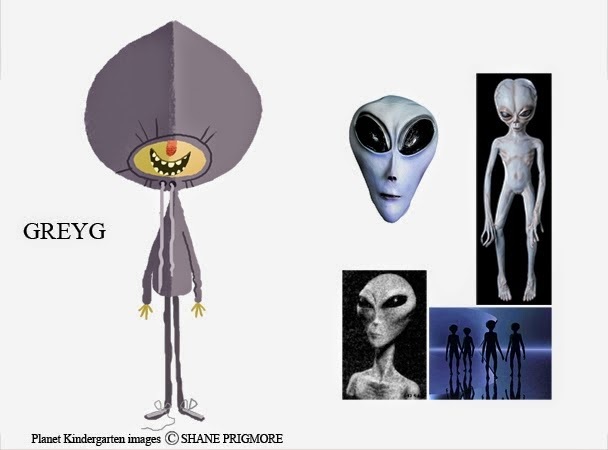 Prigmore also clearly had a great time creating the classmates - I mean the "aliens from many galaxies on Planet Kindergarten" - for the book, and well he should given his film career. This level of attention makes PLANET KINDERGARTEN especially fun to pore over again and again. The narrator experiences some difficulties while testing the conditions outside the space capsule when he and an classmate (Greyg) "disagree over the equipment," and are seen fighting over a red rubber ball. They are sent to isolation (time out on a bench) and bond when they agree that it is no fun. Mealtime is great, but nap time is a challenge. But our hero knows what they say at NASA, "Failure is not an option." The mission is over almost before he knows it, and the little space traveler heads home for a splashdown (bath) and bed. The final scene shows him "training to go back to Planet Kindergarten tomorrow," practicing sharing a red rubber ball with his toy robot. 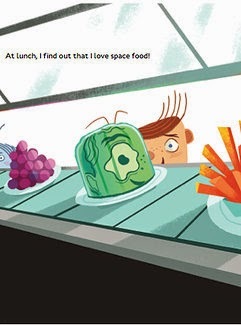 PLANET KINDERGARTEN is so much fun and so clever, I almost with that it wasn't specifically about kindergarten so that I could read it to a wider audience. That said, I'd read it to a wide range of ages because the comparisons are so wonderful and the illustrations so amazing. Don't deprive any kids of this excellent book!